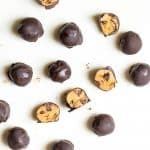 For those days where turning on the oven is not an option, but you still want the sweet and satisfying taste of chocolate chip cookies, Chocolate Chip Cookie Dough Truffles will do the trick! 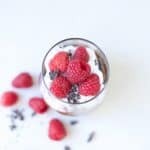 These delectable bites are everything you want in a dessert: deliciously tasty, easy to make, minimal ingredients, and sure to please a crowd. Vegan and Paleo too! 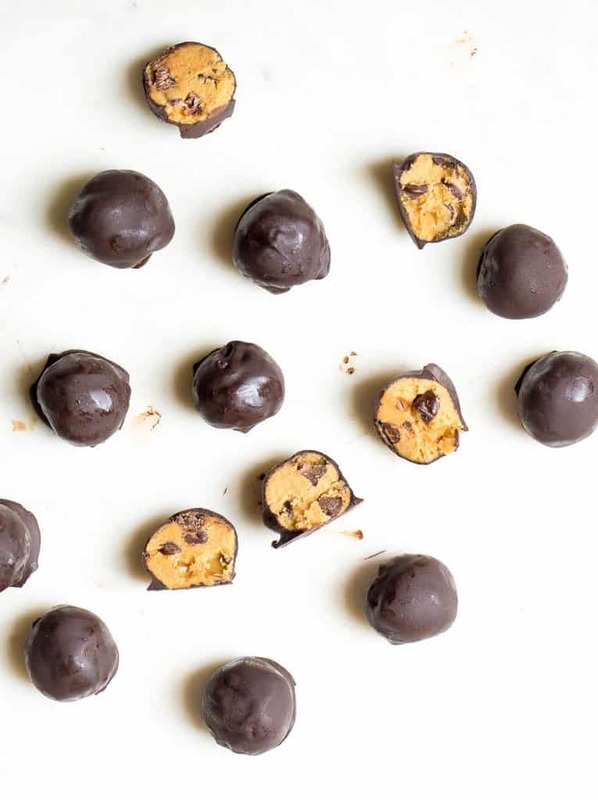 Fact #1: These Chocolate Chip Cookie Dough Truffles might* have disappeared in my house faster than any other dessert I made all summer. 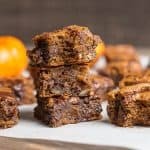 Fact #2: They were shared with family members and friends who had ZERO clue they were a Paleo and Vegan treat, and were met with enthusiastic “OMG, these are sooooo good” type comments. Fact #3: These are easy enough to make by both a 10 year old and an 8 year old without supervision. Are you convinced yet, that these glorious need to be made ASAP?!?! If you are anything like me, chocolate chip cookies might be your favorite dessert. It was a childhood staple for me, and one my mom mastered. And….. I was definitely the kid who looked forward to chocolate chip cookies so that I could eat the dough. My kids are no different. 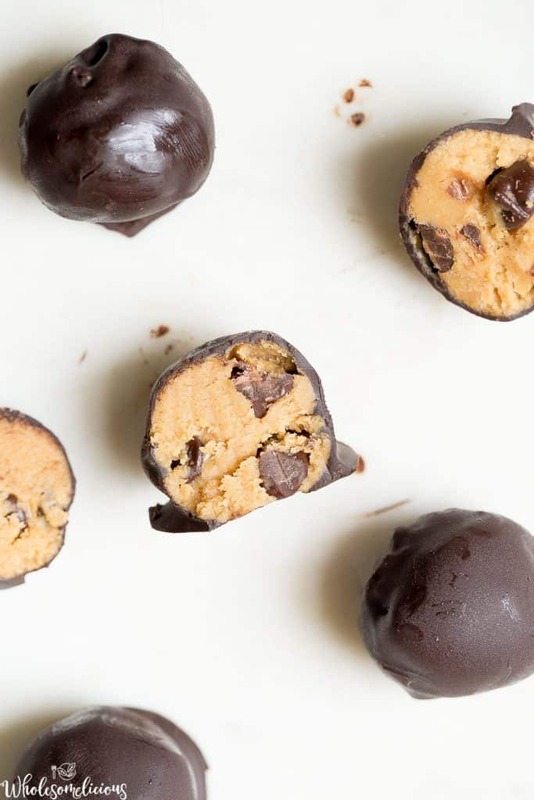 So imagine how giddy excited they were when mom presented them with these irresistible cookie dough truffles?? So what makes these treats so irresistible?? The cookie dough is pretty darn delicious. 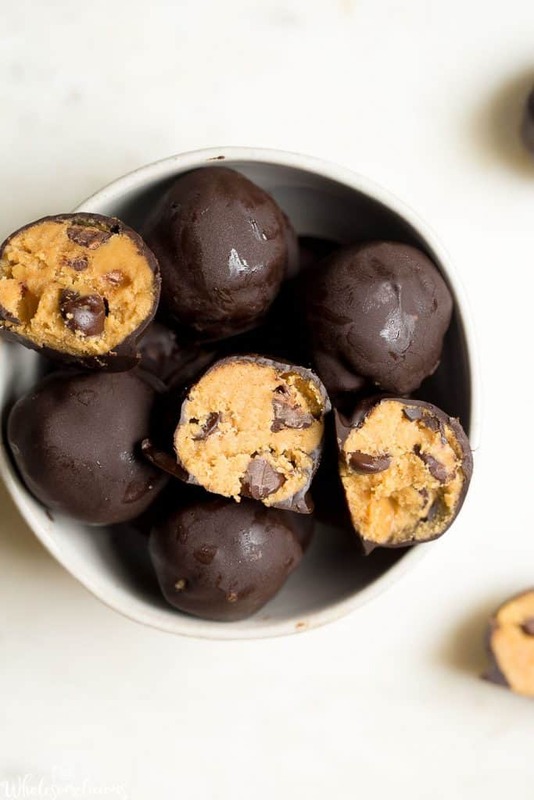 A combo of cashew butter, real maple syrup, almond flour, vanilla extract, and chocolate chips creates a perfectly textured, naturally sweetened, and slightly nutty tasting cookie dough. It’s just really good you guys. No need for butter, flour, or brown sugar. Plus, that stuff makes us feel like crap after eating it….. So once the “cookie dough” is slightly chilled and rolled into several balls, the chocolate coating seals the deal. It also tastes better right out of the fridge, and should be stored there to keep fresh. However, if your family is anything like mine, they won’t last!! In a medium sized bowl, using a large wooden spoon or even a hand mixer, mix together cashew butter, almond flour, maple syrup, vanilla extract, and salt. Once batter is well incorporated, stir in 1/2 cup chocolate chips. Chill the dough in the fridge for at least 15 minutes. In a microwave or using the stovetop, melt the remaining chocolate chips and the coconut oil. 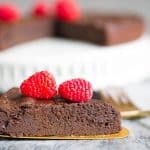 If using the microwave, do 30 second intervals, and stir after each interval so the chocolate is smooth and doesn't burn. 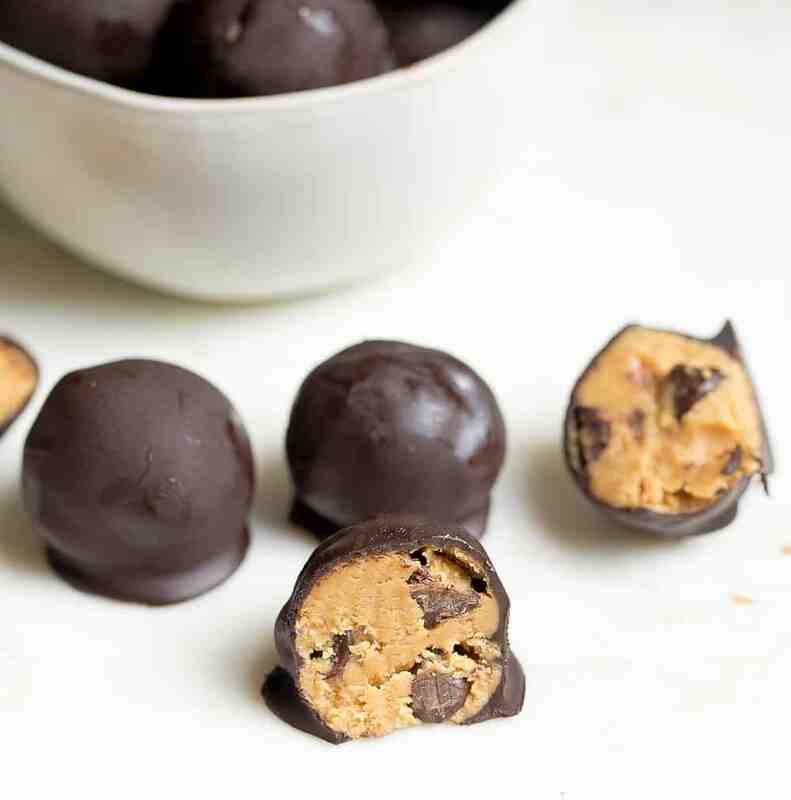 Roll the cookie dough in 1.5 inch balls, and place on parchment paper covering a cookie sheet. Dip each ball in the bowl of melted chocolate using a fork or a toothpick. Place back on the parchment paper. Place the truffles in the fridge until the chocolate has hardened, and the truffles are firm to touch. This can take anywhere from 30 minutes to 2 hours. *I use Paleo friendly chocolate chips, Enjoy Life. 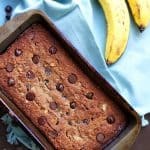 You can also use unsweetened chocolate chunks or chips. These look amazing! Do they think they would work with almond butter instead of cashew?